All our brake discs are mounted, purged and ready to use, supplied with plates already mounted and a 2 year warranty. 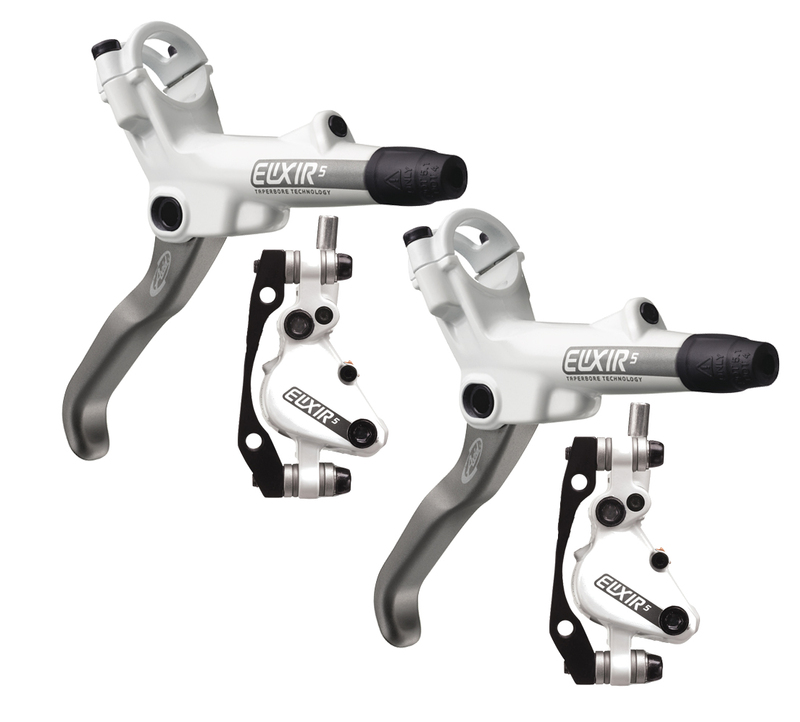 The Elixir uses a new architecture brake that offers many benefits to the functioning and reduced weight level, but also gives it an aesthetic brake fine and discreet! TaperBore technology used at the lever, the tank can be integrated directly into the body of the lever and provides a higher power and braking also easier metering of this power. Ergonomic geometry, setting the lever position without tools, left or right, new HS1 disc assembly. Weight: 605 gr (Pair diskless with adapter) Hose length: 75 cm - 145 cm Lever Material: Tungstun Grey Aluminum, Carbon Fiber Lever option, Aluminum Body Design of bracket: 2 Piston, Forged 2-Piece Aluminum Finish: Gloss Black Insert: Organic, Top Loading Fluid: DOT 5.1 Editing: Ambidextrous Setting: Reach Adjustment, Tri-Align Caliper Positioning, Special features: TaperBore Technology, MatchMaker Compatible, Split Clamp Technology: TaperBore TECHNOLOGY, DEEP STROKE MODULATION, POWER RESERVE GEOMETRY ™, DTRI-ALIGN ™ CALIPER POSITIONING SYSTEM ™, INTEGRATED RESERVOIR, DOT 5.1, REACH ADJUST, TOP-LOADING PADS, MATCHMAKER COMPATIBLE TaperBore ™ Technology The term "TaperBore" refers to a unique and revolutionary locking system patent pending for our new Elixir and Code levers. It is lighter, has a very sleek, improves leverage and especially gives you more power and control. Deep Stroke Modulation ™ The boundary between fact sudden braking and brake so suddenly that you skate, is minimal. A Stroke Modulation allows riders to perfectly navigate that line problem and even control the most powerful brakes with finesse. Power Reserve Geometry At the end of the day, a brake lever simply multiples the force your hand generates (just like the nut cracker). Power Reserve Geometry ™ Avid is by itself a way of thinking about the physics of leverage and comfort of your hands. This philosophy is fundamentally different than others on the market brakes. Due to pivot placement, physics dictates that with other brake levers your fingers tend to slip off the ends as you pull. Avid is different. We designed our levers with the pivot closer to the handlebar, closer than anyone has ever dared to market. This reduces the inner lever stroke and an arc that naturally hugs your fingers, allowing you to provide greater stopping power. What's great is that every Avid lever has it. System of Tri-Align Caliper Positioning ™ Another original Avid technology making your life: it is no easier brake to install and adjust. With the positioning system of Tri-Align Caliper ™, aligning the caliper to the rotor literally takes seconds. Just loosen the CPS bolts, then press the brake lever while tightening the screws. Perfect alignment of the bracket, it's as simple as that. Mounting plates from above When maintaining your bike is the only thing between you and the road, every second counts. With our mounting pads from the top, the new disc brake pads can be installed without removing the wheel without having to work under the caliper or pad juggling upside down, so you'll be ready to go again faster. Supplied without hard with screws, IS adapter plates and instructions. AVID 2012 ELIXIR 5 Paire de Freins Blanc sans disques clasificado 5.0 de 5 por 2. Rated 5 de 5 por Anónimo de Commentaire sur ce produit Envoi un peu long en point relai mais gratuit donc... colis soigné, matériel léger et bien fini... le concept levier près du cintre et un peu déroutant au départ (pour moi), concept trialigne toujours aussi facile (idem juicy) : achetés en replacement des mes oro 18, ils les remplacent avantageusement : puissance mordant... look blanc du plus bel effet ! top rien a redire ! merci alltricks ! Rated 5 de 5 por Anónimo de Commentaire sur ce produit Emballage nickel, envoi rapide, montage simple, frein très puissant par rapport aux juicy 3 bref je recommande !